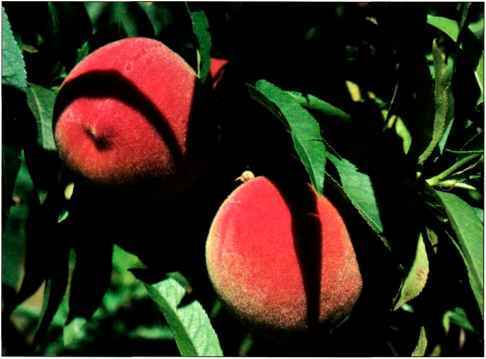 Fairhaven' This large peach is bright yellow with an attractive red cheek and light fuzz. The firm freestone flesh is yellow with red at the pit. The fruit freezes well. The tree has showy flowers. Good for the West. Origin: Michigan. 'Flavorcrest' A large, firm, yellow freestone with good flavor, its skin is blushed red. Good for California. Origin: California. Garnet Beauty' This variety is an early sport of 'Redhaven'. Medium to large semifreestone fruit hangs on the tree until overripe. The firm flesh is yellow streaked with red and is slightly fibrous. The tree is vigorous and hardy and produces heavy crops that achieve good size and color even inside the tree. It is susceptible to bacterial leaf spot. Good for the North. Widely available. Origin; Ontario, Canada. 'Golden Jubilee' An old standby, this medium to large freestone has skin mottled bright red. The flesh is yellow, firm, and coarse. The tree is hardy and sets heavy crops but is self-thinning. Good for all zones. Widely available. Origin: New Jersey. Redhaven' One of the finest early peaches, this medium-sized freestone is widely recommended. The skin is deep red over a yellow ground. The flesh is yellow, firm, and non-browning. Fruit sets heavily and is good for freezing. This tree needs heavy thinning but rewards with outstanding fruit. The tree is spreading, vigorous, and highly productive and resists bacterial leaf spot. Good for all zones. Widely available. Origin: Michigan. Note: 'Early Redhaven' is nearly identical, but two weeks earlier. stone for Southern California. The tree has average vigor and productiveness. The fruit has yellow skin with a red blush, good flavor, and firm flesh. Available in Southern California. Origin: California. 'Veteran' A favorite in western Washington and Oregon, this medium to large fruit is yellow splashed with red and has medium fuzz. The nearly freestone flesh is yellow and soft. The tree is vigorous and highly productive-one of the very best in cool Pacific climates. Good for the West. Origin: Ontario, Canada. Babcock' The small to medium-sized fruit is light pink blushed red with little fuzz. The skin peels easily. The white flesh is red near the pit, tender, juicy and has a mild flavor. The medium to large tree is spreading and vigorous, but needs heavy thinning early in the season to produce large fruit. Good for the West, particularly Southern California. Origin: California. Early Elberta' (Gleason Strain) This large freestone matures 3 to 10 days before 'Elberta'. The flesh is yellow and is of better flavor than 'Elberta'. It is good for canning and freezing. The tree is hardy and consistently productive. Good for the South and West. Widely available. Origin: Utah. 'J. H. Hale' The skin of this extralarge freestone is deep crimson over a yellow background and nearly fuzzless. The flesh is golden yellow and firm. This variety needs cross-pollination for best production. Good for all zones. Widely-available. Origin: Connecticut. 'July Elberta' ('Kim Elberta') This variety is best suited for the Willamette Valley in Oregon. The medium-sized fruit is greenish yellow-blushed and streaked with dull red and very fuzzy. The yellow-flesh is of high quality. The tree is vigorous and bears heavily but is susceptible to bacterial leaf spot. Good for the West. Origin: California. Loring' This medium-sized freestone has a slight fuzz and is blushed red over a yellow ground. The flesh is yellow, firm, and medium textured. It resists bacterial leaf spot. Good for the North and South. Widely available. Origin: Missouri. Suncrest' This firm, large freestone has a red blush over yellow skin. It is susceptible to bacterial leaf spot and should be grown in the West and other areas without this disease. It is hardy in cold sections of the North. Widely available. Origin: California. Belle of Georgia' ('Georgia Belle') The skin of this outstanding white peach is red blushed over creamy white. The flesh is white and firm, has excellent flavor, and is fair for freezing but poor for canning. The tree is vigorous, very winter hardy, and productive but very susceptible to brown rot. Good for the North and South. Widely available. Origin: Georgia. Blake' This large freestone has red, slightly fuzzy skin. The flesh is yellow and firm. It is good for freezing and excellent for canning. It is susceptible to bacterial canker. Good for the North and South. Origin: New Jersey. 'Cresthaven' The skin of this medium to large freestone is bright red over a gold ground and almost fuzzless. The flesh is yellow and nonbrowning. The tree is hardy. It is good for canning and freezing. Good for the North and South. Widely available. Origin: Michigan. 'Elberta' This large freestone is the old favorite for a midseason crop. The skin is red blushed over a deep golden yellow. The fruit tends to drop at maturity. It is resistant to brown rot. Good for all zones. Origin: Georgia. 'Fay Elberta' In California this ranks as the most popular ail-purpose freestone peach. It equals 'Elberta' for eating fresh, cooking, and canning, and excels it for freezing. It ranks below 'Elberta' in adaptability, growing where winters fall to 20° F. The color is yel low heavily blushed with red. This one may require considerable thinning for large fruit. The blossoms are especially showy. Origin: California. 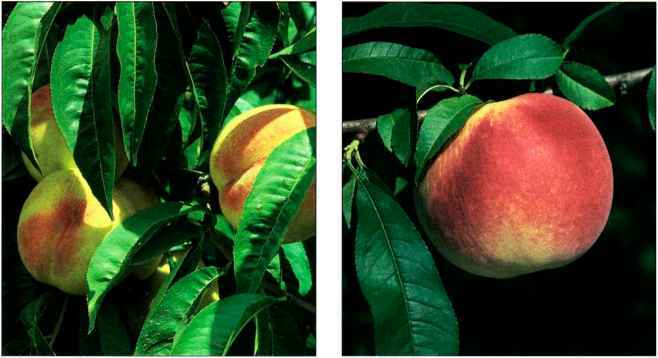 'Jefferson' Especially suited to localities where late spring frosts are a problem, this peach is noted for its fine texture and flavor. The skin is bright red over a bright orange background. The flesh is yellow and firm. It is a reliable producer that cans and freezes well. It has some resistance to brown rot. Good for the North and South. Origin: Virginia. 'Madison' Adapted to the mountain areas of Virginia, this variety has exceptional tolerance to frosts during the blossoming season, setting crops where others fail. The skin of this medium-sized freestone fruit is bright red over a bright orange-yellow ground. The flesh is orange-yellow, very firm, and fine in texture. The growth of the tree is average to vigorous. Good for the North and South. Widely available. Origin: Virginia. 'Raritan Rose' This vigorous, winter hardy tree pro duces delicious white-fleshed freestone peaches. The skin is red. Available in the East and North. Origin: New Jersey. 'Redskin' This popular peach ripens after 'Elberta'. It has good red color and handles well. 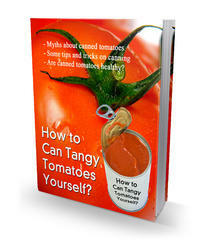 It is excellent for freezing, canning, and eating fresh. Widely available in the East and North. Origin: Maryland. 'Rio Oso Gem' The skin of this large freestone is red over a yellow ground; the flesh is yellow, firm, fine in texture, and nonbrowning. It is good both fresh and for freezing. The blossoms are light pink, very large, and showy, and appear later than most peach blossoms. The tree is productive but not vigorous. Good for the South and West. Widely available. Origin: California. 'Sunhigh' This is a very good medium to large freestone. The skin is bright red over a yellow ground. The flesh is yellow and firm. The tree is vigorous and spreading. It is very susceptible to bacterial leaf spot and requires thorough summer spraying. Good for the North and South. Origin: New Jersey.